In the middle 1960’s, there arose a significant number of approaches to the quantitation of molecular attributes influencing their behavior and function. These approaches took the form of some physical properties and various approaches to quantitate molecular structure. Since molecular structure is an attribute most directly correlateable with function, this approach prospered and led to a number of useful methods at that time. These included molecular orbital theory, graph theory, information theory and some spatial quantitative methods. As we begin the second half of this century of study, we have on hand a plethora of methods to achieve these goals. The extent of this burgeoning has given rise to a descriptive categorical term, Mathematical Chemistry. This volume appears on the scene to celebrate the emergence of Mathematical Chemistry in its second half century. It brings to the molecular scientist several new approaches plus the introduction of variations on existing ideas. The editors of this text have wisely and thoroughly gathered together a broad representation of contributions. About a half of the book contains contributions of scientists active in the life sciences. These chapters focus primarily on methods of creating models of drug function relative to molecular structure. This realm of applications of mathematical chemistry has contributed significantly over the years to the process of drug design. We would still be in the empirical realm of trial and error to find a new drug, without the role of structure-activity models using many good methods. The other half of the chapters describes current work, new applications, and new approaches to quantitation of the essential aspects of molecular structure. The imaginative ideas flowing through these chapters are quite impressive. It creates a text that should be on the shelf of every scientist working quantitatively at the molecular level. There is a stimulation arising from the book that will excite the creativity in many readers. Such a book is essential in every field of science where periodic overview and exposure to new ideas is essential. Congratulations to the authors who have contributed to the book and congratulations to the editors who have selected the mix of articles and authors. 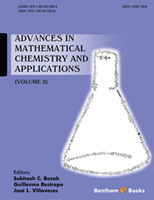 We are glad to introduce our readers to volume 2 of the eBook Advances in Mathematical Chemistry and Applications. This volume, like volume 1, has thirteen chapters written by well-known experts from around the world. As shown in the two figures of the preface of volume 1, chapters of volume 1 and 2 of this eBook deal with several mathematical approaches to chemistry, e.g. topology, graph theory, information theory, to name but a few. Readers interested in a particular mathematical area, say topology, are directed to those figures to know which other chapters report novel topological approaches in chemistry. In the first chapter entitled “Topological Efficiency Approach to Fullerene Stability - Case Study with C50”, by Ante Graovac, Ali Reza Ashrafi, and Ottorino Ori, the authors use topological approaches for classifying fullerene isomers, a group of structures important both from the mathematical and chemical points of view. In this approach two shape descriptors: topological compactness and topological sphericality turn out to be of key importance for the ordering. Andrés Bernal, Eugenio Llanos, Wilmer Leal, and Guillermo Restrepo, authors of the second chapter, entitled “Similarity in Chemical Reaction Networks: Categories, Concepts and Closures”, claim that chemical identity is the result of chemical reactivity and analyze chemical entities by studying reaction networks. In such formalism the identity of a substance is given by those related to it, which gives place to an interpretation in the framework of Category Theory. The similarity between substances is studied through topological spaces, with closures as key concepts for similarity. The third chapter, “Discrimination of Small Molecules Using Topological Molecular Descriptors”, by Chandan Raychaudhury and Debnath Pal, reviews the use of numerical topological graph invariants to differentiate molecular structures of small size, a subject of utter importance in chemo and bioinformatics. “The Periodicity of Molecules” is the title of the fourth chapter, by Fanao Kong, Weiqiang Wu, Na Ji, and C. L. Calson, where the authors review their work on periodic tables for di, tri, and tetra-atomic molecules. These tables are further used to estimate properties of molecules, such as bond length, binding energy, ionization potential, among others. The fifth chapter, “The GRANCH Techniques for Analysis of DNA, RNA and Protein Sequences”, by Ashesh Nandy, reviews two classes of methods, viz., graphical methods and graph invariant techniques, for the characterization of sequences of DNA, RNA, and proteins, which constitute the GRANCH (graphical representation and numerical characterization) methods. The author shows how these characterizations can be used in the study of viral proteins as an example of application. Jarad B. Niemi and Gerald J. Niemi are the authors of the sixth chapter, entitled “Linear Regression, Model Averaging, and Bayesian Techniques for Predicting Chemical Activities from Structure”. The chapter reviews several statistical approaches to deal with situations where there are more chemical structure measurements or available molecular descriptors/ properties than the number of chemicals with measured property values, which are commonly found in many current Quantitative Structure-Activity Relationship (QSAR) and Quantitative Structure-Property Relationship (QSPR) studies. “Marine Algal Toxicity Models with Dunaliella Tertiolecta: In Vivo and In Silico”, by Melek T. Saçan, Marjana Novic, M. Doğa Ertürk, and Nikola Minovski, is the seventh chapter of this volume. In their chapter, authors model toxicity of phenolic compounds to Dunaliella Tertiolecta using counter-propagation artificial neural networks and point out to the importance of D. tertiolecta, a marine alga, for toxicity determination of chemical substances. In the eighth chapter of this volume, “Anti-Tubercular Drug Designing Using Structural Descriptors”, Manish C. Bagchi and Payel Ghosh discuss the use of molecular descriptors, including graph invariants, and robust statistical methods like ridge regression in the formulation of models for the discovery of drugs active against tuberculosis, a contemporary problem to human health worldwide. “Integrating Bioinformatics and Systems Biology for Exploring Novel Lipid Pathways in Infectious Diseases” is the title of the ninth chapter, written by Sonali Shinde, Vineetha Mandlik, and Shailza Singh. The authors develop mathematical models for delving into the complexity of biological interactions related to Schistosomiasis and Trypanosomiasis, two neglected tropical diseases affecting a large segment of world population. Their specific focus is on the lipid metabolism of the two parasites causing the diseases. Santiago Medina, Susana Casas, Mariana Restrepo, Alejandro Alvarez, Adriana J. Bernal, and Andrés F. González are the authors of the tenth chapter, entitled “Applications of Molecular Docking and Molecular Dynamics on the Inhibition of Quorum Sensing Systems”. Given that bacteria communicate through chemical signals allowing the regulation of a variety of physiological functions and group behavior (quorum sensing), a key concept in medicinal chemistry is to inhibit such a communication through novel molecules. In this chapter the authors describe some computational approaches used to find such inhibitory molecules for several bacteria. The eleventh chapter, entitled “Designing Models for Metalloenzymes”, by James F. Weston, discusses how quantum chemistry plays an important role in designing small organometallic catalysts. Weston particularly analyzes quantum mechanical approximations for the process of catalysis, showing the advantages and disadvantages of those approximations. “The Multi-Factor Coupled Protein Folding: Insights from Molecular Dynamics Simulations” is the title of the twelfth chapter, where Xiaomin Wu, Gang Yang, and Lijun Zhou review factors that are important for protein folding, a process of paramount importance in understanding the physiological function of proteins. The factors analyzed are space limitation, where entropy constraints play a central role; solvent effects, where solvation models are discussed; physicochemical properties and their relationship with non-covalent interactions; and structural modifications, such as mutation and protonation. Christoph Flamm, Bärbel M. R. Stadler, and Peter F. Stadler are the authors of the thirteenth chapter, entitled “Generalized Topologies: Hypergraphs, Chemical Reactions, and Biological Evolution”, where they discuss how the topological concepts of similarity, neighborhood, connectedness and continuity pervade chemical and biological situations such as chemical reaction networks and evolutionary processes. By finding, however, that those concepts are not laid down to the mathematical formalism of topology, they undertake the task of doing it by avoiding the topological concept of open set and instead taking advantage of the mathematical richness of closure operators. We sincerely hope the second volume of the book, analogous to the first volume, will be highly appreciated by researchers and scholars worldwide. The editors of the eBook “Advances in Mathematical Chemistry and Applications” and Bentham Science Publishers would like to gratefully acknowledge the dedicated work of the following distinguished scientists who reviewed the chapters of this book and gave valuable suggestions as well as constructive criticisms to the authors and editors that substantially enhanced the quality of this volume.